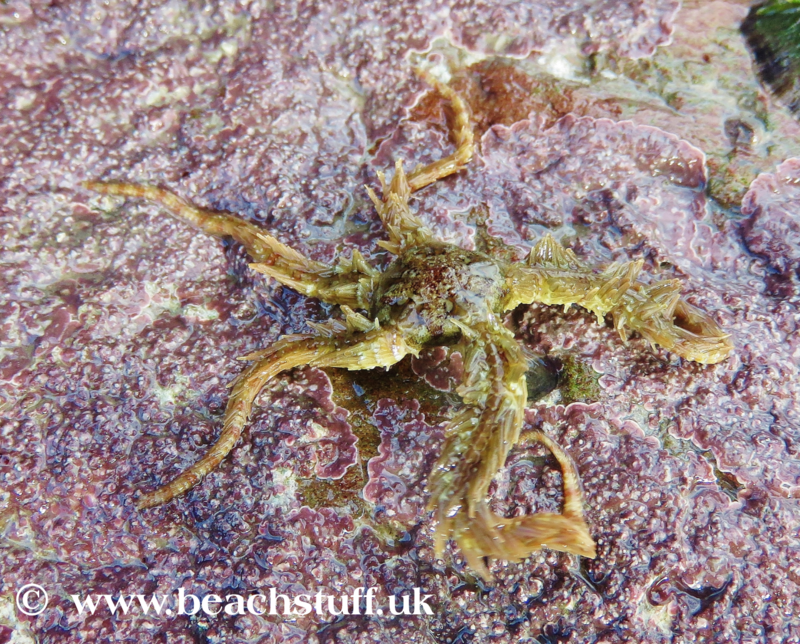 These can be found clinging to the sides of rock pools - either in the water or out of it. 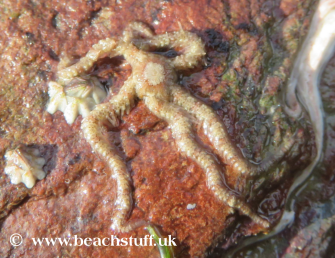 They usually have five arms - but it is possible to find ones with six arms - and the five armed ones can lose an arm or two and still survive. 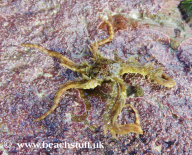 Rockpool specimens tend to around 8 - 12cm across. 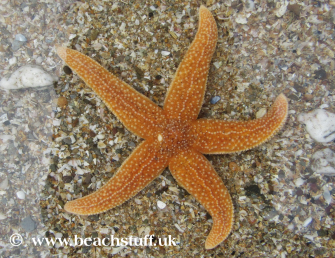 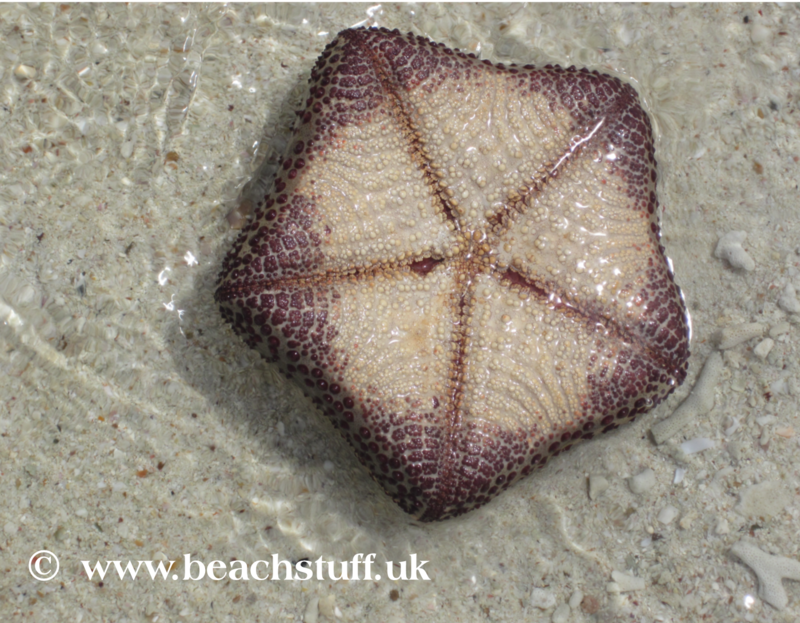 Starfish can range in colour from light beige to deep rust-brown and purple. 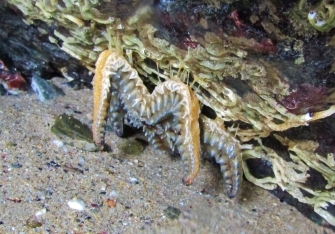 If starfish lose a leg. they can grow one back - although it is very slow. 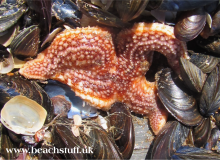 Starfish have hundreds of suction tubes that help them move around. 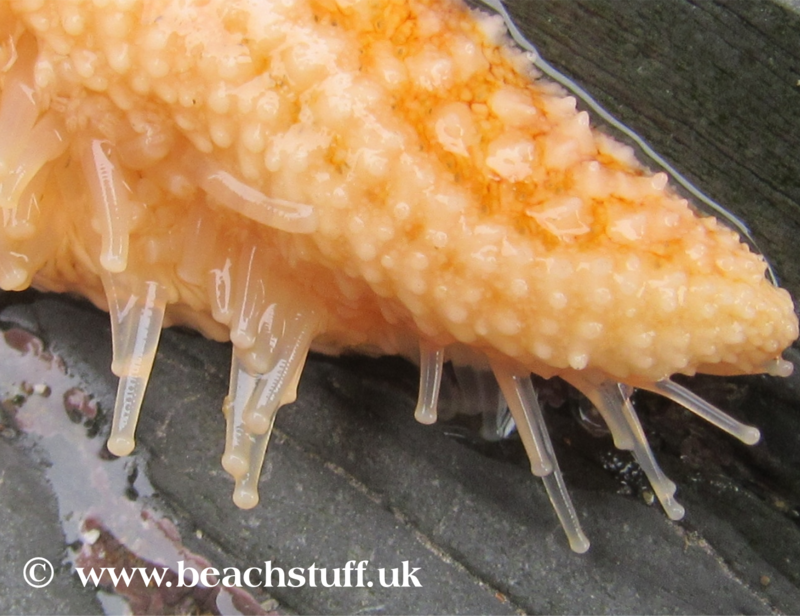 A starfish bulging like this suggests it is eating. Mussels are a common choice for starfish meals. 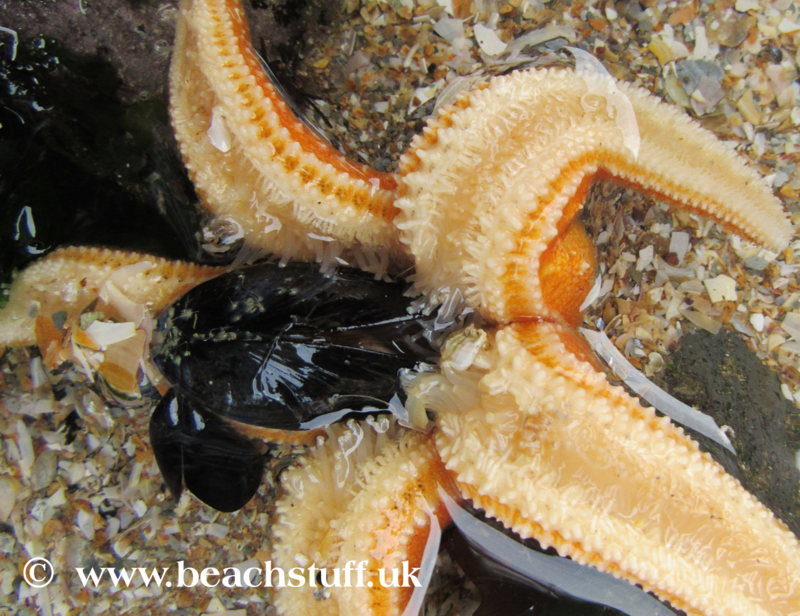 Starfish eat by putting their stomach outside their bodies to digest their food. 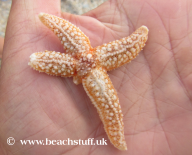 A starfish retracting its stomach - clip is speeded up to double time. 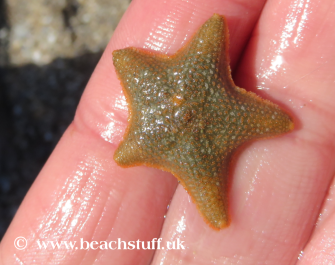 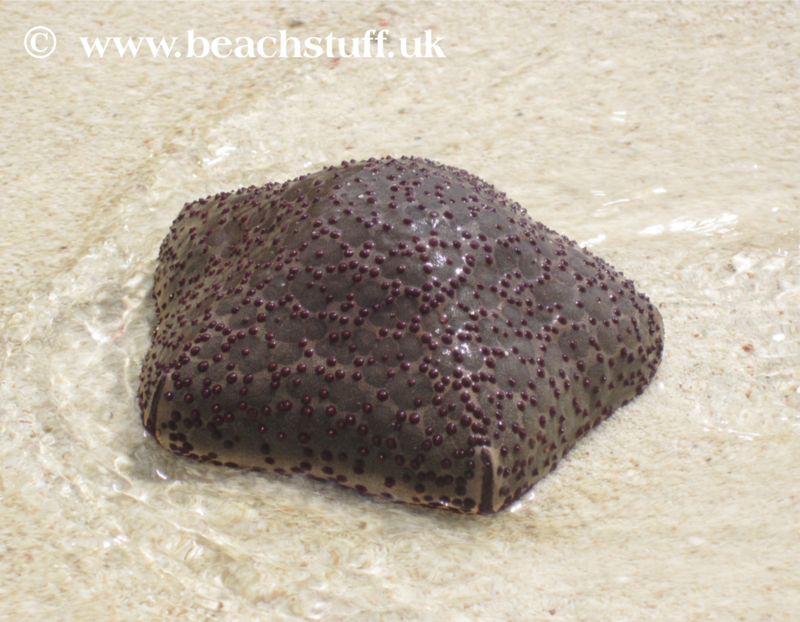 Cushion stars have relatively wide bodies and short fat arms. 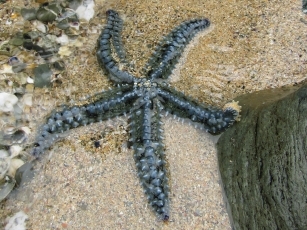 They are generally found under stones in wet areas in the lower shore. 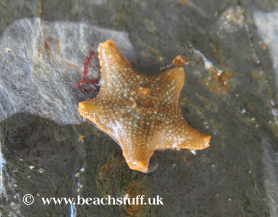 Tend to be 2-3cm across - but can be found a little wider. 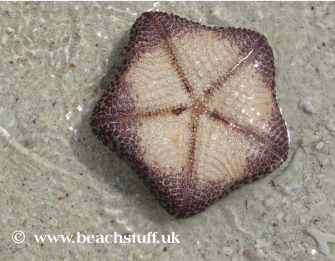 Cushions stars can vary in colour from orange through to brown and green. 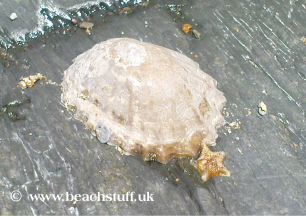 This tiny baby, 5mm across, is dwarfed by a limpet shell. 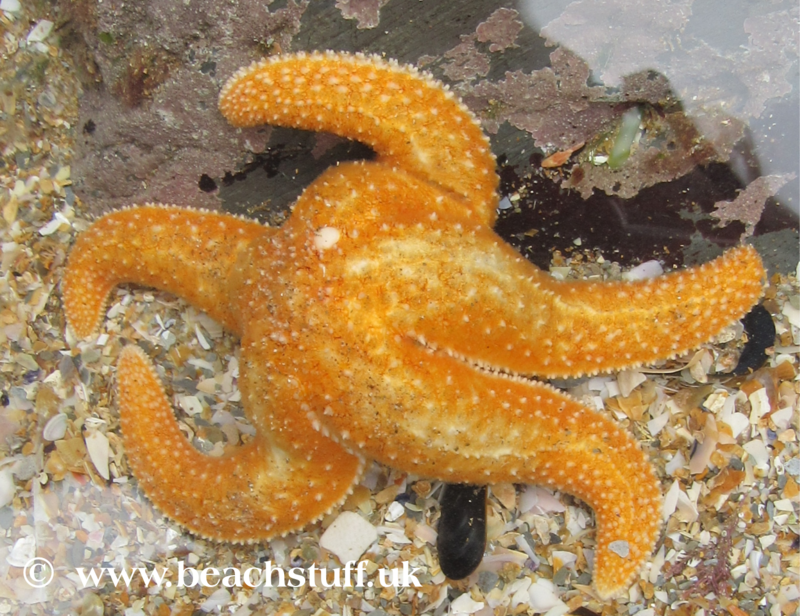 These are closely related to common starfish but have a rounder body and longer, more spindly legs. 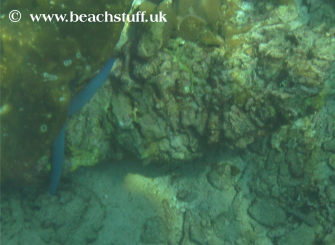 They use their legs to crawl around the sea floor looking for scraps (see the video clip below) which they pass to their mouths using those legs again. 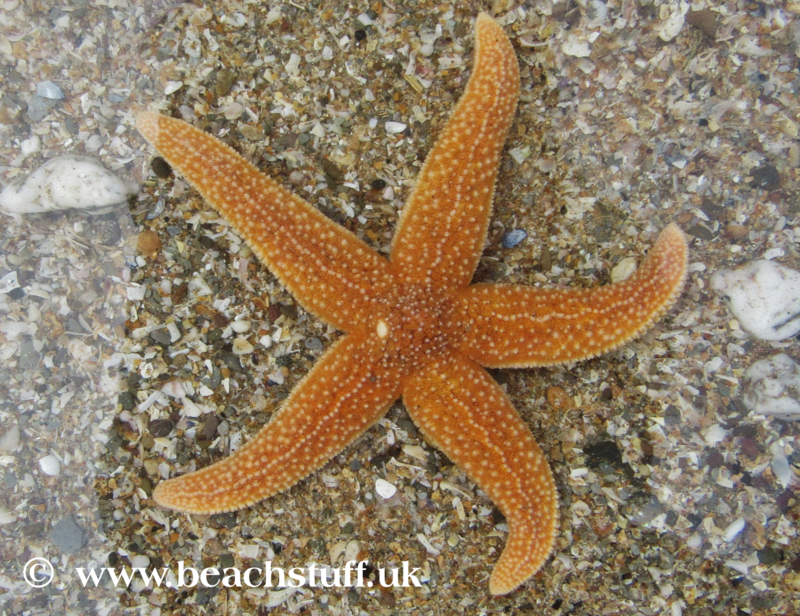 They are usually found under stones at the lowest point of the tide. 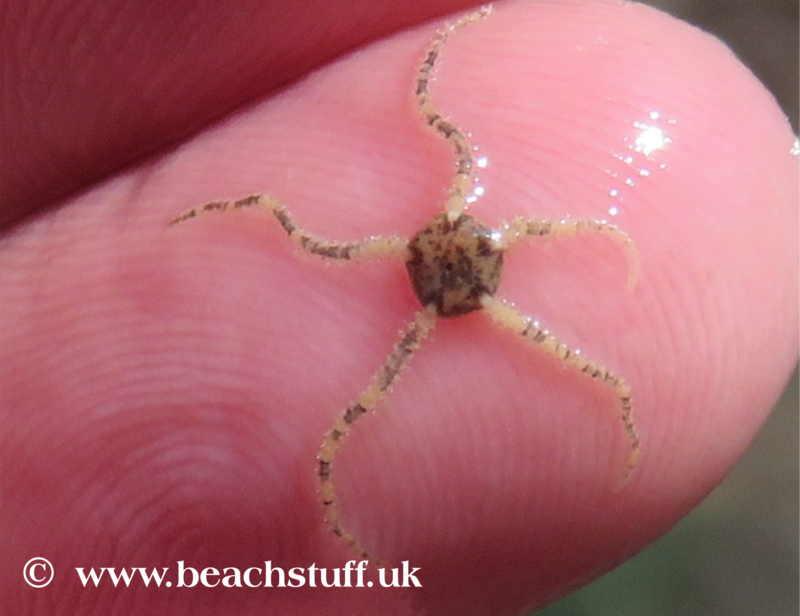 They can be very tiny. 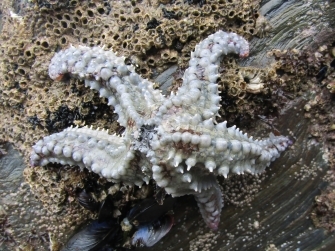 It can be pale but is often bluish/greenish but is most distinguishable by the distinct lines of spines along its legs. 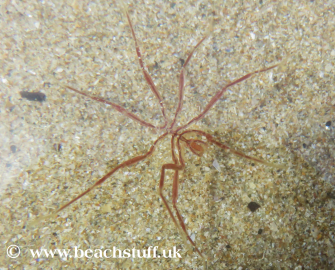 At first glance, you might think you've got a brittle star, but sea spiders are not even related. 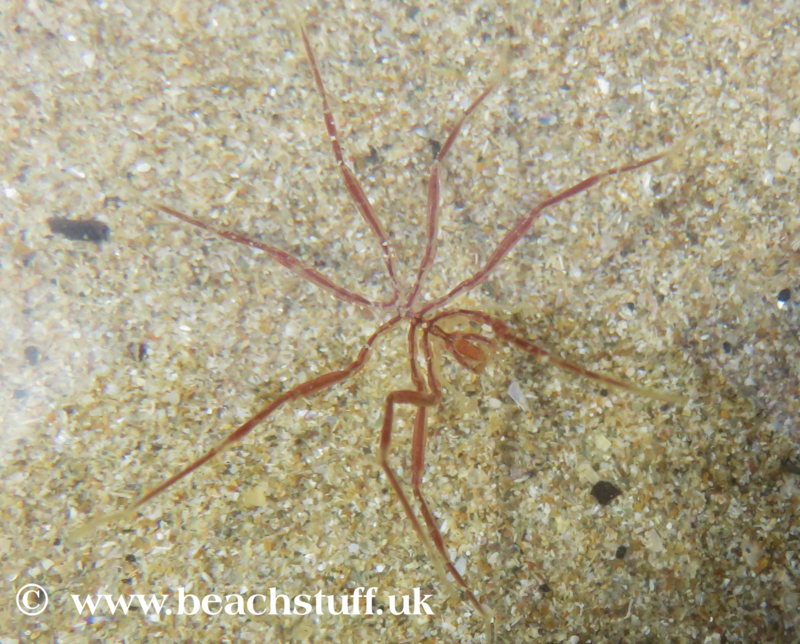 They are marine arthropods - a large group that includes insects, crabs and barnacles - seems that one thing they have in common is a large number of legs. 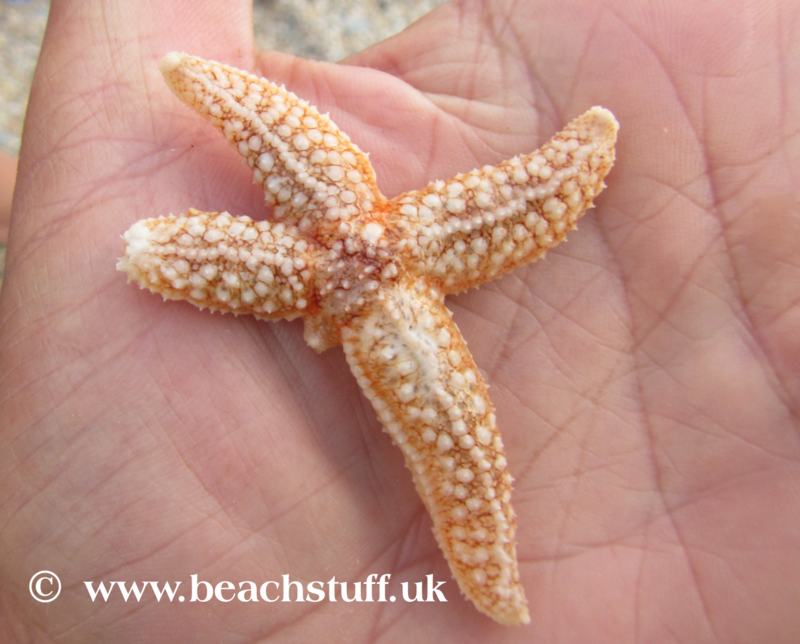 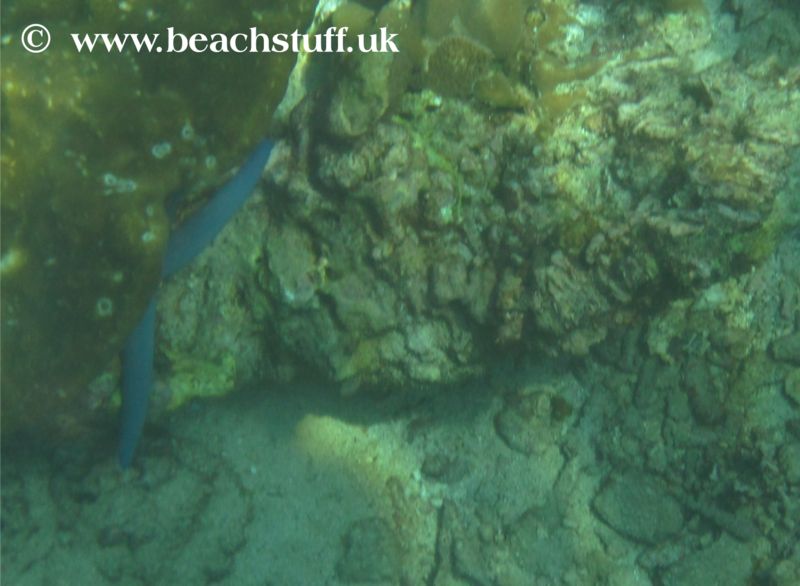 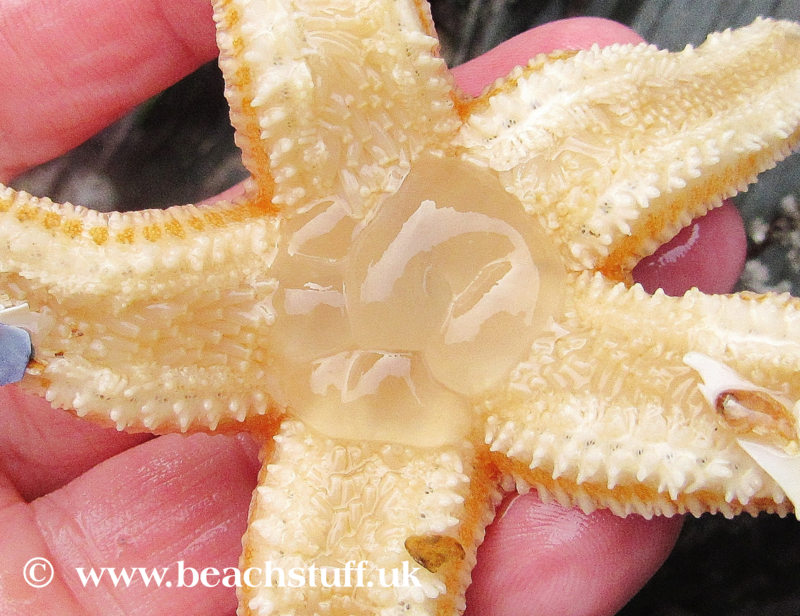 A lot bigger than the UK cushion star - it can grow to about 30cm wide. 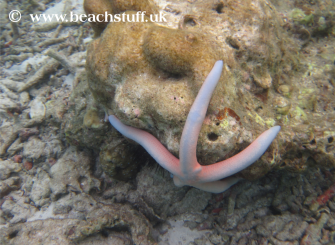 Like the common starfish, eats by ejecting its stomach and obsorbing its prey - mainly coral. 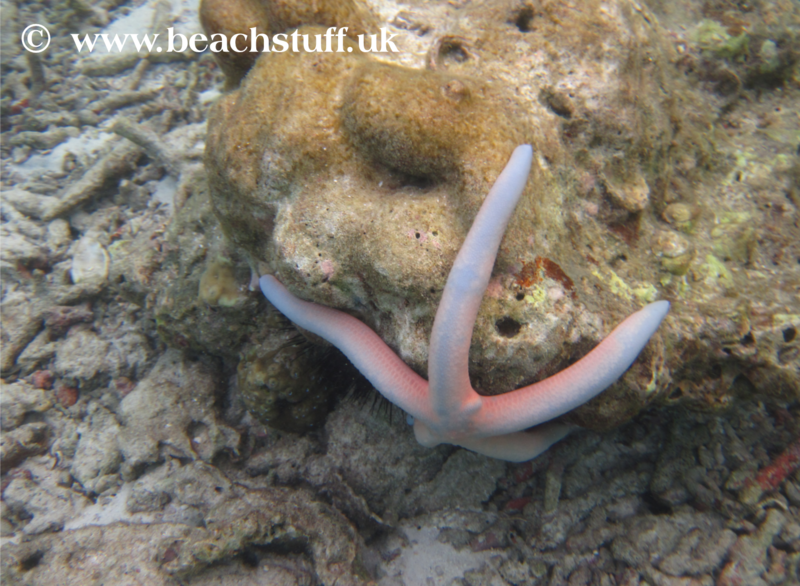 This sea star can grow to around 30cm across - and is sometimes more blue (right) than others. 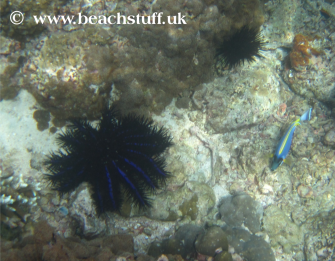 The crown of thorns can have up to 21 arms and can grow to 35cm across.